Keep your 99 cents. iTunes lets you turn any MP3 into an iPhone ringtone. Back when I was a Palm Centro owner, I used the excellent freeware app MiniTones to turn Brendan Benson's "Spit It Out" into my ringtone. But when I upgraded to an iPhone, I discovered that iTunes charges 99 cents for ringtones--even if you already own the song. My cheapskate nature doesn't allow for that. (It's not the money, it's the principle of the thing.) So I decided to "roll my own" iPhone ringtone, which turned out to be a fairly easy process. Check the Start Time and Stop Time boxes, then enter times for each (no more than 30 seconds apart, the maximum length for a ringtone). I used 0:00 and 0:30, respectively, as "Spit It Out" has a perfect ascending lead-in. 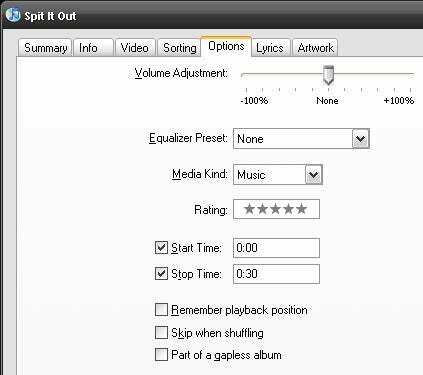 Click OK, then right-click the song again and choose Create AAC Version. You should immediately see a new 30-second version of the song. Drag that version out of iTunes and into the folder of your choice. Delete the 30-second version from iTunes and undo the Start Time/Stop Time changes to the original. Open the folder containing the 30-second AAC file you dragged out of iTunes, then change the file extension from .m4a to .m4r. Double-click it and it immediately gets added to iTunes' ringtone library. Finally, sync your iPhone. When it's done, you can head into the settings and select your new ringtone. That's all there is to it! What song(s) will you assign to ringtone duty? Leave a comment and nominate your favorites. Meanwhile, have a happy new year! I'll see you back here in '09. This story, "Turn Any MP3 into an iPhone Ringtone" was originally published by TechHive.